Why are the top speeds for jet engines higher than for propellers? I realize turbines are more efficient than piston engines, but if that were true, then why don't turbo-props reach jet speeds? The thrust of a propeller is proportional to the inverse of airspeed, while the thrust of a pure turbojet is roughly constant over airspeed in the subsonic region. This means that two airplanes with the same static thrust, one propeller-powered and the other jet-powered, will reach very different top speeds. And, no, piston engines are more efficient. Turbojets, on the other hand, profit from flight speed because the intake pre-compresses the air when it slows down ahead of and in the intake. This pre-compression lifts the pressure level of the whole engine, so it sees an increased mass flow with increasing speed, producing higher thrust. This effect by itself would increase thrust in proportion with the square of flight speed, but the same effect which reduces the thrust of a propeller acts on a turbojet as well. This effect, however, is less pronounced because the jet accelerates less air to a higher speed, and both cancel each other, roughly. Turbofans are more similar to propeller engines, so here the thrust goes down over airspeed, and more so for higher bypass ratios. Turboprops are even closer to piston-powered propellers, so their thrust drops even more with increasing speed. This means that the speed at which drag equals thrust drops when you move from turbojets to turbofans, and further to turboprops and is lowest for piston-powered propeller aircraft. I'd like to visually illustrate why propellers aren't suited for high speed flight. First, let's consider a variable-pitch propeller mounted on a capable engine. If you study the two sketches I drew above, you'll notice as the horizontal speed increases (right image), the thrust direction moves away from the forward, despite the increased airflow and local lift on the blade. This is what many textbooks erroneously call "taking a bigger bite", but as you can see, it's the same bite (angle of attack). So the faster you fly a propeller, the lower forward thrust you get, making you unable to go any faster. 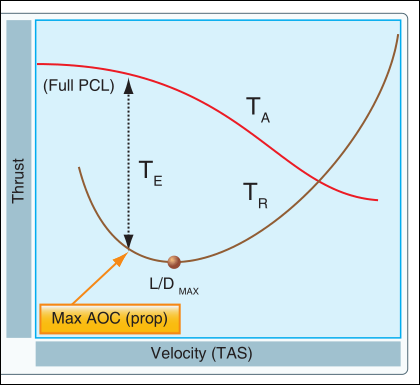 Above graph shows TA (Thrust Available) for a propeller decreasing the faster the plane flies. Another factor is when you fly as fast as the propeller's tip speed—say Mach 0.75 (a Boeing 737 Classic in cruise)—the airfoil of each blade will be flying much faster than your forward speed (compare the hypotenuse to the vertical/horizontal sides in the topmost image). The airflow around the airfoil will be supersonic. Straight wings (and blades) don't do well in supersonic speeds (too much nasty drag). For a fixed-pitch propeller, let's say we dropped a plane with a fixed-pitch propeller from a mothership at high speed, the airflow will hit the top surface of the propeller disk, creating backward thrust—effectively propelling the plane backwards. It's best when the plane's forward speed keeps the propeller disk from approaching the sound barrier, and doesn't result in the thrust being directed too much away from the forward. For a turbo prop the limiting factor to some extent is the efficiency of the propeller, not the engine. There have been a bunch of attempts at very fast turbo props over the years with the fastest most likely going to the XF-84H Thunderscreach but in all of the cases the propeller becomes the limiting factor. First off, to get going in the speed range you mention with a usable size propeller your tips will go supersonic which presents problems into its self. The XF-84H suffered from this and you can read up on why that was a noise issue. On top of the noise issue it simply becomes more efficient to use a jet at those speeds so in practice its the power plant of choice. Many of today's top preforming turboprops easily encroach on the speed of light jets. Not the answer you're looking for? Browse other questions tagged aircraft-performance propeller jet turboprop propulsion or ask your own question. Which engine is more efficient between turboprop vs jet? In what way are the Concorde's engines considered efficient? Can propeller driven aircraft sustain speeds at or above Mach 1? Are turboprops more efficient than piston engines (thrust per fuel consumption)? Why is max endurance different for jet and props? What does the 'hp' rating actually signify, with respect to an aircraft engine? Why are commercial propeller aircraft smaller than commercial jet aircraft? Why were turbojets the first kind of turbo-engines, instead of turboprops? Why is there still a preference for turboprop airliners over the new regional jets? Is precession a problem for two-bladed propellers?